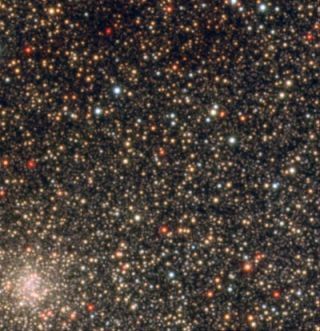 Part of one of the four regions of the sky in the direction of the galactic bulge in which the astronomers measured the iron and oxygen content of stars. The MilkyWay might not have formed through the merger of several smaller galaxies as previously thought, but bysome other unknown process, a new study suggests. Home to oursolar system and viewable in our own backyards, this crowd of stars called the Milky Way offersastronomers one of the best chances for understanding how a galaxy forms. "The MilkyWay is the only galaxy in the universe that we can study in detail. Still, wehaven't yet understood how it did form," Manuela Zoccali of the Departmentof Astronomy and Astrophysics at the Pontifical Catholic University of Chiletold SPACE.com. "Shedding light on its formation is fundamental tounderstand how all the galaxies in the universe have formed." The MilkyWay, often seen from Earth as a hazy halo ofstars in the night sky, is a spiralgalaxy with several arms ofgas, dust and stars, coiling out from a spherical nucleus in the shape ofa flattened disk. The starry center is called a bulge because it protrudesfrom the flattened disk. Until now,the best theoretical models predicted dwarf galaxies beget larger and largergalaxies, as multiple star packs clumped together or a heftier galaxy started gobblingup its neighbors. If this were the case for the Milky Way, Zoccali said, thestars in the galactic bulge should have once been part of the disk. Over eons,as more galactic mergers occurred, some of the stars should be tugged towardthe center to form the bulge. "We haveproved that this is not the case," Zoccali said. Using theEuropean Southern Observatory's Very Large Telescope (VLT) array in Paranal, Chile, an international team of astronomers, led by Zoccali,examined the chemical makeup of 50 giant stars in the direction of the galacticbulge. They discovered the stars at the center ofthe Milky Way showed distinct element amounts compared to the disk stars, asign that the two galaxy components formed separately. "In otherwords, bulge stars did not originate in the disk and then migrate inward tobuild up the bulge but rather formed independently of the disk," Zoccali said. Theydetailed their findings in the current issue of the journal Astronomy andAstrophysics. In essence,by cracking these chemical codes, the astronomers were able to peer back intime at the stars'births. Just beforea star is born, its dusty neighborhood in space is swirling with interstellarmatter. The chemical elements within the matter vary over time and location. Sostarsborn from one batch of dust and gas would hold a different chemical make-upthan stars born in another cosmic cloud. Thechemical codes also hold other clues. "What you're really seeing when you lookat these chemical fingerprints is a star formation rate, or a star formationhistory," Verne Smith, at the University of Texas at El Paso, said in a telephone interview. Two keychemical markers are oxygen and iron. Oxygen is predominantly produced duringthe explosion of massive, short-lived stars called Type II supernovae,while iron originates in the explosion of longer-lived stars called Type Ia supernovae.As these stars are blown to pieces, they spew their innards into interstellarspace where it becomes the seeds for other stars. Basically, ifa star is loaded with oxygen with minimal iron the star may have developed at alightning-fast rate, scientists explain. Theastronomers found that the stars within the bulge contain more oxygen relativeto iron than their counterparts out in the disk, where we reside. Bycomparing the chemical compositions of the stars with computer models, theastronomers suggest the galactic bulge formed in less than a billion years,most likely as a result of a series of starbursts when the universe was young. How did theindependent star gangs hook up? "We astronomers really haven't figured out thispart yet," Zoccali said.